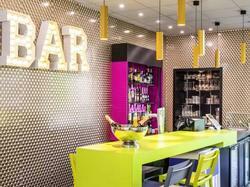 Hôtel balladins Antony is located in Antony, a short drive from the A6 and A10 and 7 minutes from Paris-Orly Airport. With free WiFi, each room has a flat-screen TV with satellite channels, Canal+, desk and a private bathroom. A buffet breakfast is available in the mornings and the hotel's restaurant, Cornaline, serves seasonal cuisine for lunch and dinner. Guests of the Antony can relax in the evenings with a drink in the hotel bar. Offering a 24-hour reception, Hôtel balladins Antony is situated 1.5 km from Fontaine-Michalon RER Station, which offers fast access to central Paris. Guests can access Paris by car in 20 minutes. This family suite offers a Smart TV, a seating area and a bathroom with shower or bathtub. This modern room features a 40-inch LCD TV, free WiFi and a private bathroom with shower or bathtub.